There are a few ways you can check out the new Office 365 admin center. TIP: The Admin tile appears only to Office 365 administrators. The new Office 365 admin center looks like this. Here are the features and settings you’ll find in the left-hand navigation of the Office 365 admin center. Learn more about admin tasks in Office 365 admin help. Home This is the landing page in the new Office 365 admin center. You’ll see where to manage users, billing, service health, and reports. Users Create and manage users in your organization, like employees or students. You can also set their permission level or reset their passwords. Check out Add, remove, and manage users in Office 365 admin center. Groups Create and mange groups in your organization., such as an Office 365 group, distribution list, security group, or shared mailbox. Learn how to create and manage groups. Resources Create and mange resources, like a SharePoint site collection. Learn how to create site collections. Billing View, purchase, or cancel Office 365 subscriptions for your organization. View past billing statements or view the number of assigned licenses to individual users. Learn how to manage billing. Settings Manage global settings for apps like email, sites, and the Office suite. Change your password policy and expiration date. Add and update domain names like contoso.com. Change your organization profile and release preferences. And choose whether partners can access your Office 365 admin center. Reports See at a glance how your organization is using Office 365 with detailed reports on email use, Office activations, and more. Learn how to use the new activity reports. Health View the service health at a glance. You can also check out more details and the service health history. 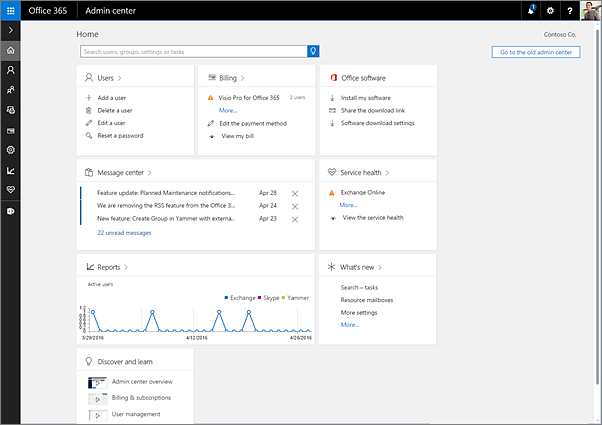 Check out Service health in the Office 365 admin center. Admin centers Open separate admin centers for Exchange, Skype for Business, SharePoint, and Azure AD. Each admin center includes all available settings for that service.